Dartmouth people are intimidating. First-day-of-class icebreakers often lead to awkward situations, like when you provide the fun fact that you have a dog named Milo and the person across from you responds with her discovery of a dwarf planet. I’ve had moments of doubt about what I bring to Dartmouth, but when I’m discussing feminist philosophy over mediocre waffles at Class of 1953 Commons, I’m simply grateful. I’m here, and I’ll be here whether I choose to fret about my worth or just soak in my surroundings and let them inspire me. I choose the latter. Luckily for me, there is no shortage of secretly inspiring students all around me. Some of them are a little more obvious, though, like “the unicycle kid” we all see around campus, making his way from class to class in style. Inspiration doesn’t have to come from deep, heavy morality — sometimes, a little quirk is all you need. Even though he doesn’t remember asking for it, Wells got the unicycle for Christmas in 2012, and it soon transformed into a hobby he loves. Christopher Cartwright ’21 is creating a name for himself as someone who makes creative, fun outdoor things happen. His most recent endeavor was the creation of a luge in the Bema. At first it was only Cartwright and a friend, but more people soon started to trickle in. Videos were sent out to spread the word and routes were set up for people to follow. Though Cartwright has had success, getting students excited and mobile is a common problem with event organizers. Agnes Ugoji ’22 is trying to recruit more people for Soul Scribes, the slam poetry group at Dartmouth. Ugoji thinks slam poetry has a unique power as an art form. Ugoji also remarked on how she just wants to bring people together, ruminating on the uniting powers of slam poetry’s emotional vulnerability. “I may not have class with everyone but at least I have some type of connection,” she said. Similarly, when I asked Cartwright why he loved planning these big events so much, after much consideration, he landed on the reason why: He likes “getting groups together to do things.” Its simplicity made me smile. My interview with the horticulturalist Dan DiPietro ’22 brought me back to those intimidating icebreakers. This time, however, I didn’t feel panicked — I felt in the presence of something special. His love of plants all started in preschool, when his mother would take him out to lunch at a nearby botanical garden. Fast forward to college, and DiPietro is a carnivorous plant horticulturalist. He funded his own greenhouse at home, where he has about 1,000 carnivorous plants of 100 species, some of which he brought to Dartmouth’s greenhouse. He gave a guest lecture at Princeton University, and he and his friend have written a manuscript about their field research in the New Jersey Pinelands and submitted it to Cornell University in hopes of publication. Even though I’m not a biology person, I decided to check out Dartmouth’s corpse flower when it bloomed in November. It turns out that DiPietro was responsible for pollinating the plant after it had bloomed. I very intelligently declared that to be an evolutionary (big word!) flaw. However, DiPietro informed me that the corpse flower was designed this way to get cross-pollinated, since cross-pollinated offspring tend to be more vigorous. My mistake. He was able to solve this problem at Dartmouth’s greenhouse by using a method he used at home. The previous method of self-pollination that people had used for corpse flowers yielded less than 5 percent pollination. DiPietro’s? One hundred percent. Unsurprisingly, DiPietro thinks that most everyone can get something out of visiting the greenhouse, where he is now the carnivorous collection manager. I asked DiPietro how he feels being known as “the plant guy.” He said he doesn’t carry that title. He’s actually — a big surprise to me after 15 minutes of plant talk — not even a biology major. “My end goal career-wise would be some kind of technology entrepreneurship where I have my own company or product,” DiPietro said. Wells also has other aspirations. “There are people who make their whole careers out of unicycling, but that’s probably not going to be me,” Wells said. As for Cartwright, he likes the idea of being known as the fun, spontaneous events guy. All of these students — unicyclist, event planner, slam poet and horticulturalist — are just a small sample of the people who make this college what it is. Wells summed it up, ever so eloquently, in terms of the unicycle. 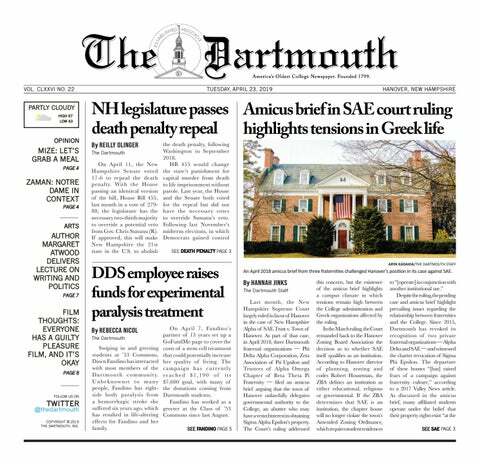 “It’s just something more to add to the fun, quirky, flair-esque-ness of Dartmouth,” he said. Cartwright is a former member of The Dartmouth staff.